Sometimes there’s a small spot that you know just needs a little something. I have one of those in my dining room near the kitchen entrance. I happened to be browsing in a small French shop in Northern New Jersey and these pieces just seemed to be made for it. 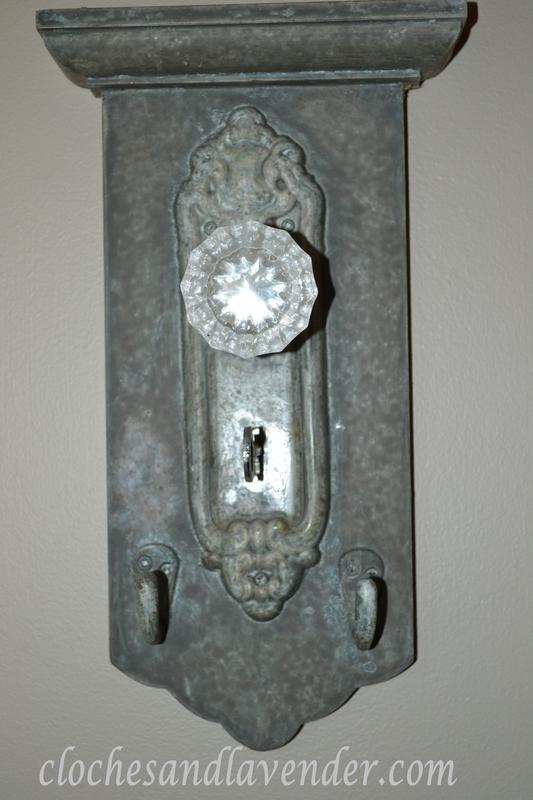 The old crystal door knob and key hole with an old key, have a great patina and the added Hooks allow for some holiday tassels to be hung. 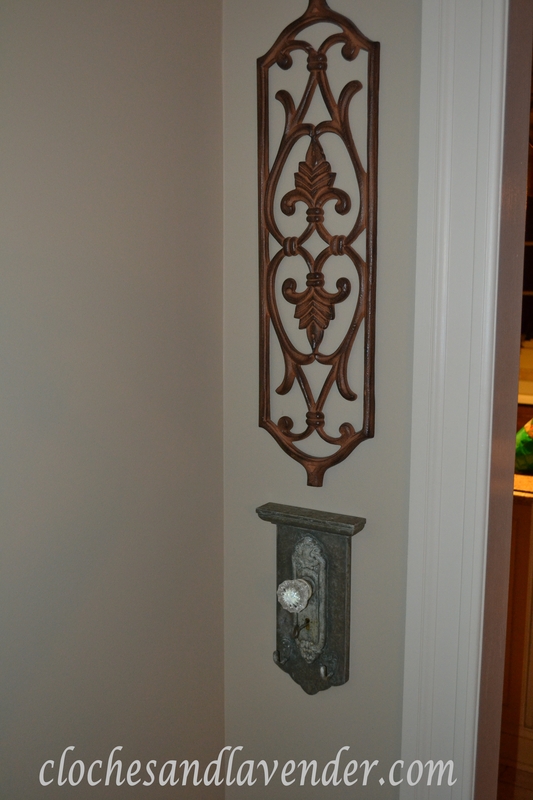 The iron piece has a rust tone patina and compliments the other pieces in the room, including the light fixture and paint color. They both add some whimsy to my dining room and work nicely in “that spot” LOL. What a great look! I love old door knobs and keys. How neat! Love these. They do look nice positioned near one another. Wow. These look great. I love love love the door knob. One day, in my dream bathroom, I want to have a bunch of these as towel hooks!! Thank you. That would be a great idea in you bathroom. You can also use the glass curtain holdbacks as I did in my laundry room. Take a look at my post on that. Very cool! Those old door knobs are the best! That old glass door knob and hardware are fabulous!! You sure have a talent for decorating! 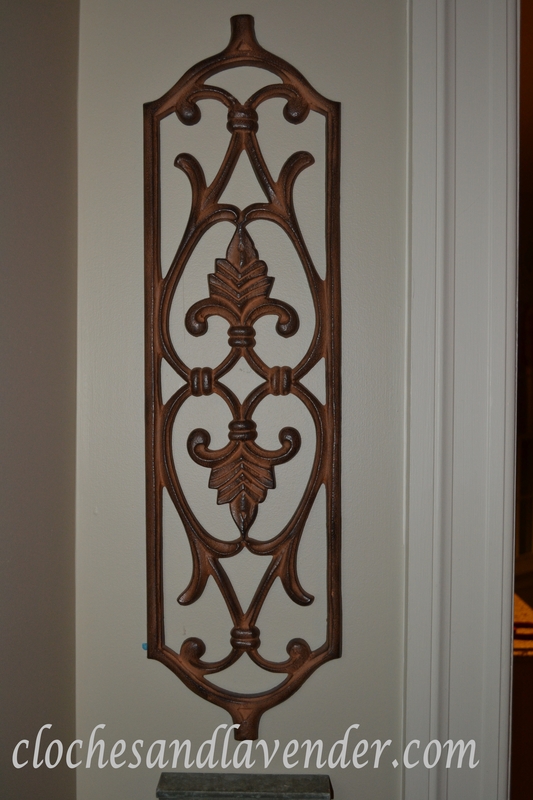 These pieces look awesome on your wall and I never would have thought to pair them together, but they look fabulous. I wish we had a “French” type shop in my area. Have a great day! We only have a few left. A lot of shops by us have closed which is shame they were really good shops. Thanks for the compliment. They TOTALLY were made for that spot! Looks great!! What great finds! I love where you placed them for everyone to enjoy. Thanks for sharing on Simple & Sweet Fridays. Wow that is an amazing door knob. what a find. Ohhhhh…so pretty! I love old doorknobs! I follow you everyday now. I love both the pieces. Love anything that looks old, shabby and French, I am slowly turning my little cottage into a Shabby French dream. Love your blog and i love lavender.